Partial Payment is an extension for WP Travel Engine. Partial Payment makes it easier for the travelers to book for a trip or tour package in an installment payment basis. The tour operators and travel agencies can specify the partial payment rate of the trip in percentage or amount while creating the package. Later, travelers can book the package at a specified installment cost. 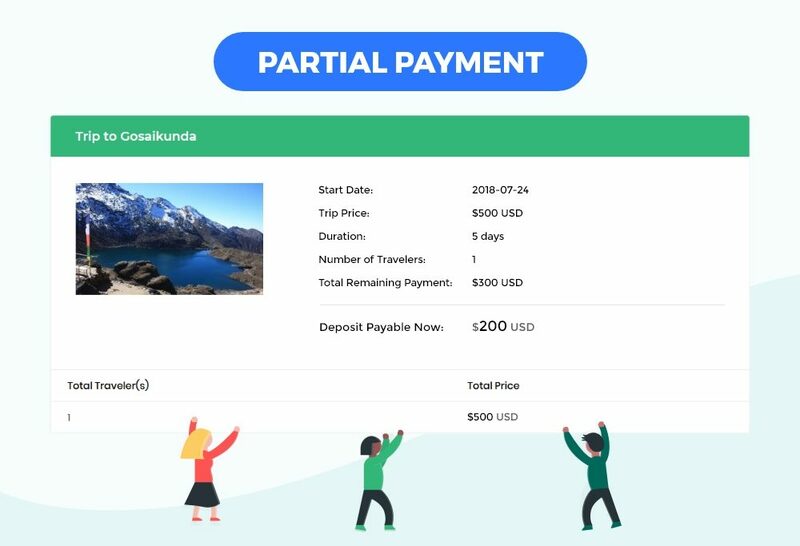 When using Partial Payment with WP Travel Engine, the travelers can view the Total Remaining Payment and Deposit Payable Amount in the checkout page. This results in a better user experience and increases in sales or conversion. Partial Payment can be applied to each trip individually. Tour Operators and Agencies can choose whether to specify the Partial Payment rate in Percentage or in Amount. Partial Payment in Percentage: The partial payment amount of the trip price in percentage to be paid while booking the trip. Partial Payment in Amount: The partial payment amount of the trip price in figures to be paid while booking the trip.